Lord Montagu ordered a special mascot for his Rolls-Royce Silver Ghost from Charles Robinson Sykes, the model was Eleanor Velasco Thornton who was secretary to Edward-Scott-Montagu, editor of "The Car" magazine. Additional information about the Rolls Royce Spirit of Ecstasy: The Spirit of Ecstasy' has has been associated with Rolls-Royce's since 1911, also known as, "The Spirit of Speed", "The Silver Lady" & "The Flying Lady", but was originally christened "The Whisper"..
Siteseen Ltd. are the sole copyright holders of this Rolls Royce Spirit of Ecstasy picture, unless otherwise stated. We only authorise non-commercial picture use and particularly encourage their use for educational purposes. 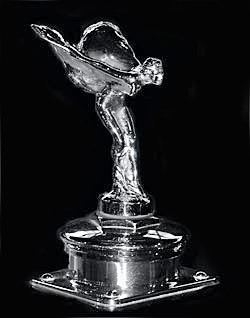 This Rolls Royce Spirit of Ecstasy picture is not in the Public Domain. 3) Use of this Rolls Royce Spirit of Ecstasy picture, or any of our pictures on websites re-distributing copyright free material is strictly prohibited.